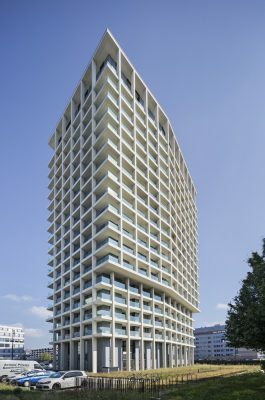 Zurich, September 2016 – “The Metropolitans“ are a new landmark in the Leutschenbach neighbourhood. 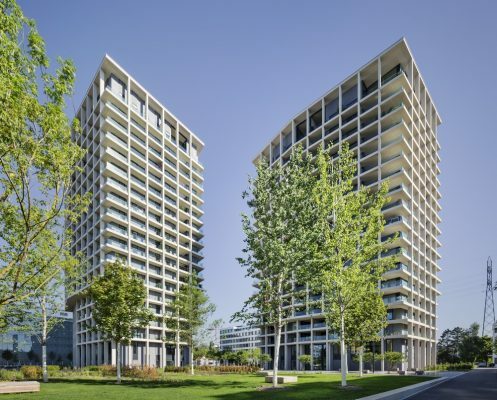 The two residential tower blocks designed by baumschlager eberle are eye-catching reference points in this rapidly developing district in the north of Zurich. 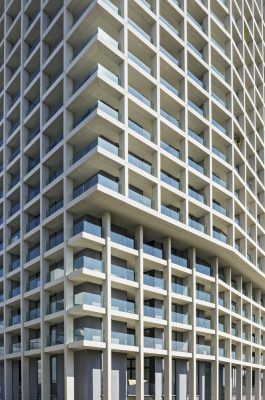 The distinguishing feature of the 60-metre-high buildings is the light, curtain wall facade of limestone concrete, which gives them a clear structure. The loggias ensure residents a considerable degree of privacy. The spacious apartments extend from front to back or are positioned over a corner. A sky lounge on the roof broadens the impressive view from the apartments to an overwhelming 360-degree panorama. The name given to the two tower blocks in the north of Zurich reflects their claim to residential quality of a special kind. Designed by baumschlager eberle, “The Metropolitans” ensemble elegantly combines structural factors with urban planning considerations. 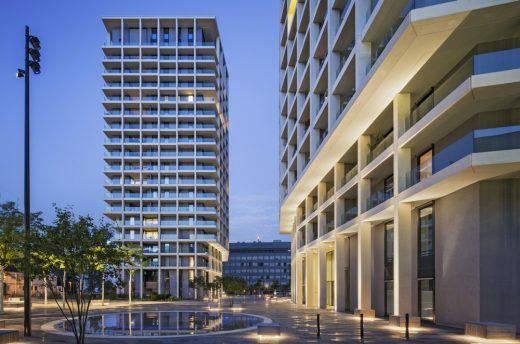 The two 60-metre-high towers standing alongside Schärenmoosstraße seem straight forward at first sight, but their sheer presence provides the Leutschenbach development scheme with a prominent landmark that is readily visible from afar. The western high-rise is deliberately positioned close to Leutschenpark at a certain distance from the road. Together with its eastern counterpart it forms a plaza, set back a little from the street, which serves as an access point to the buildings. Sabrina Contratto, managing partner in the Zurich office of baumschlager eberle, highlights the conceptual approach underlying the ensemble: “Our aim in designing these buildings is to generate quality of life. They are a response to, and greatly influenced by, the surrounding context”. The loggias forming a band around the entire volume of the building give the apartments extensive privacy. 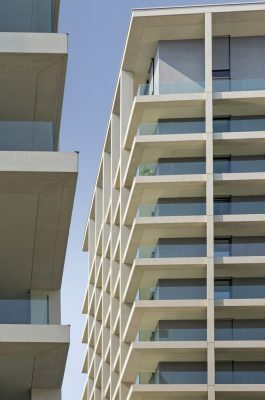 “The clearly structured façade with its deliberate combination of reticence and sophistication is the showpiece of the buildings”, says Sabrina Contratto. The open area in front acts as a bridge to the “inner facade”, the thermal envelope of the building. 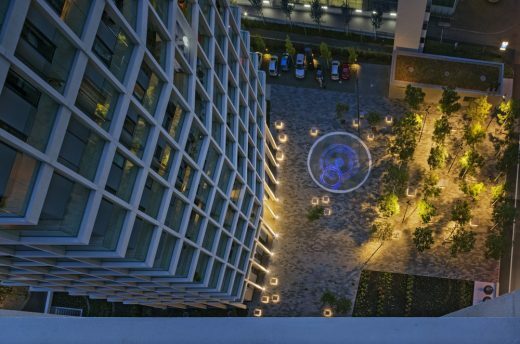 The apartments distributed over 19 floors have ground plans of between 75 and 200 square metres. They extend from front to back or are positioned over a corner. 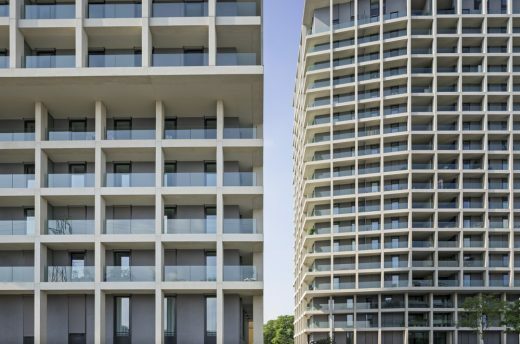 Maximum use is made in the interior of the potential offered by multi-storey accommodation. The spatial stratification from the outside in and the optimum orientation underline the quality of the planning. The windows are room-high with glazed balustrades providing an uninterrupted view over the city to the Alpine panorama. Sabrina Contratto: “There is a wonderful feeling of distance outside and of spaciousness and openness inside”. Load-bearing walls have been dispensed with inside the apartments, thus allowing considerable flexibility in floor plan design. Vertical access is via two load-bearing cores. The ceiling heights in the 212 apartments of “The Metropolitans” are generous, incorporating up to two storeys in the penthouse apartments. The lobbies also extend over two floors. 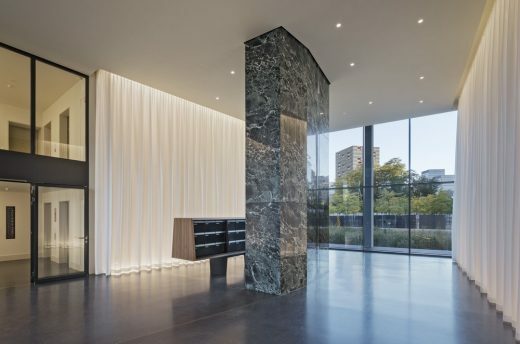 The spaciousness of the imposing reception areas underscores the urban ambience. 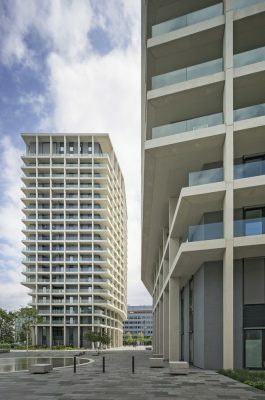 The roof terraces in both tower blocks have been designed as sky lounges with attractive seating arrangements. Accessible for all residents, they afford an impressive panoramic view over the city of Zurich.